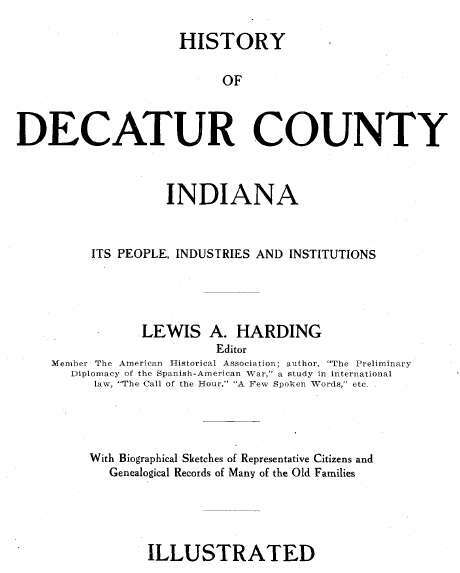 The book, History of Decatur County, Indiana, Its People, Industries, and Institutions; with Biographical Sketches of Representative Citizens and Genealogical Records of Many of the Old Families - Illustrated, by Lewis A. Harding, B. F. Bowen & Co., Inc., Indianapolis, Indiana, 1915. 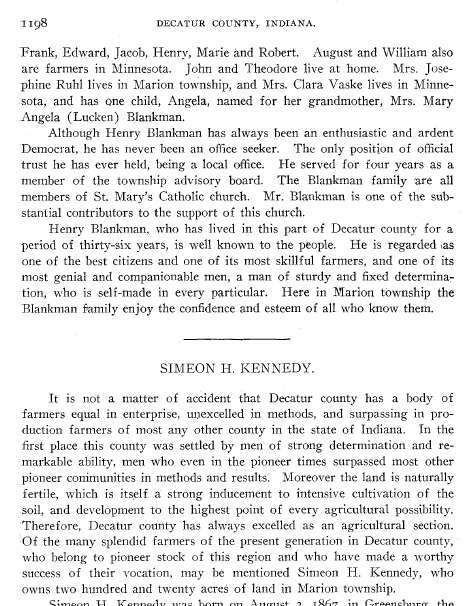 It is a very large book profiling many of the citizens in Decatur County, Indiana. 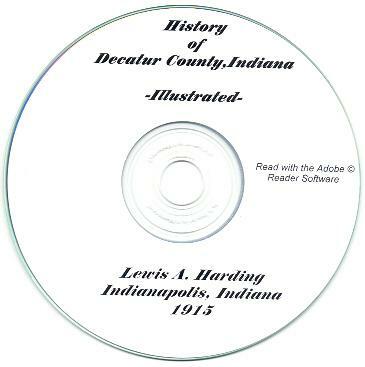 It is filled with genealogical and personal information about various Decatur County residents, their descendants, spouses, in-laws, and ancestors. It has many illustrations of individuals, and there are many biographical memoirs or sketches of individuals and families. The book has approximately 1,216 pages, a linked Table of Contents, a historical Index, and a linked biographical Index. The CD book is also fully searchable; you can search the book using the Adobe Reader 'search' function. Please note: This is not a paper book, it is a scan of the original paper book into the digital Adobe PDF format, written on a CD-ROM. You read this book on your computer using the free Adobe Reader software. It is a digital version of a hard to find book. If you could find a copy of the 1915 printed book, it would cost hundreds of dollars. 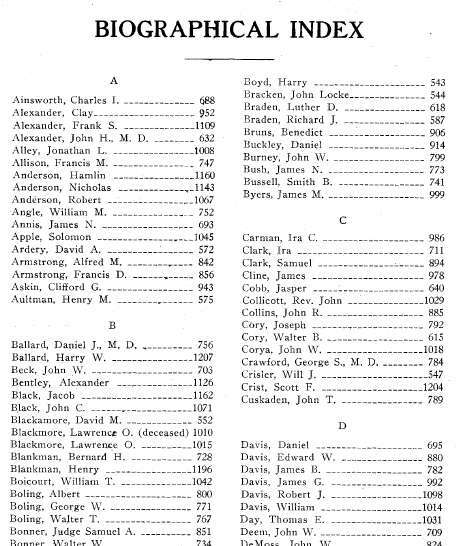 Charles Ainsworth, Clay Alexander, Frank Alexander, John Alexander, Jonathan Alley, Francis Allison, Hamlin Anderson, Nicholas Anderson, Robert Anderson, William Angle, James Annis, Solomon Apple, David Ardery, Alfred Armstrong, Francis Armstrong, Clifford Askin, & Henry Aultman. Daniel Ballard, Harry Ballard, John Beck, Alexander Bentley, Jacob Black, John Black, David Blackamore, Lawrence Blackmore, Bernard Blankman, William Boicourt, Albert Boling, George Boling, Walter Boling, Samuel Bonner, Walter Bonner, James Bostic, Watson Bostic, Henry Bowman, Harry Boyd, John Locke Bracken, Luther Braden, Richard Braden, Benedict Bruns, Daniel Buckley, John Burney, James Bush, Smith Bussell, & James Byers. Ira Carman, Ira Clark, Samuel Clark, James Cline, Jasper Cobb, John Collicott, John Collins, Joseph Cory, Walter Cory, John Corya, George Crawford, Will Crisler, Scott Crist, & John Cuskaden. Daniel Davis, Edward Davis, James B. Davis, James G. Davis, Robert Davis, William Davis, Thomas Day, John Deem, John DeMoss, Benjamin Denham, John Deniston, William Deniston, Clarence Deupree, Everett Deupree, Thomas Deupree, Otto Dietrich, Edwin Donnell, Dilver Douglas, Henry Draping, & Thomas Duffey. Leroy Eckhart, Edgar Eddelman, Oliver Elder, Daniel Elliott, Marion Elliott, Theodore Elliott, Harry Emmert, Jacob Emmert, Len Emmert, George Erdmann, John Evans, & Milton Evans. William Fear, Edwin Fee, James Foley, John Foley, Lafayette Ford, Henry Fry, & Samuel Fulton. Francis Galbraith, Joseph Garrison, John Gartin, J. Minor Gaston, Estill Gibson, Jacob Glass, William Goddard, Clarence Greeley, Charles Grover, & John Guthrie. Anthony Habig, Valentine Hahn, Chester Hamilton, Everett Hamilton, Frank Hamilton, James Hamilton, Luther Hamilton, R. Ray Hamilton, Robert Hamilton, Thomas E. Hamilton, Thomas M. Hamilton, Samuel Hanks, James Harding, Cecil Harrod, Cyrus Harwood, John Hays, Michael Heger, George Hess, Clarence Hill, Alexander Hillis, Edgar Hite, Sherman Hitt, Bernard Hoeing, Daniel Holcomb, John Holcomb, Dorcas Holmes, Webster Holmes, Harry Hopkins, James Howard, Millard Hudson, Jason Hughes, Walter Hungerford, & John Hunter. Edward Jackson, Samuel Jackson, William Jackson, Barton Jameson, Myron Jenkins, Allen Jewell, Israel Jewett, Lorin Jewett, Mathias Johannigmann, John Johnson, & Clifford Jones. John Kanouse, Samuel Kelly, Simeon Kennedy, Clarence Kercheval, James Kercheval, Edward Kessing, Francis Ketchum, William Ketchum, Gilbert Kincaid, Henry Kirby, Guy Kitchin, Joseph Kitchin, & Thomas Kitchin. Harry Lathrop, James Lathrop, William Lawson, Jephtha Layton, Orlando Lee, Albert Link, Benjamin Littell, George Littell, Sam Littell, Aaron Logan, Aaron L. Logan, George Logan, Henry Logan, John Logan, John H. Logan, Will Logan, Arthur Lowe, & Edward Lowe. Omer Manlief, Curtis McCoy, Sutherland McCoy, William McCoy, Hugh McCracken, Harley McKee, James McClaughlin, Adam Meek, George Meek, John Meek, Robert Meek, George Menzie, Cornelius Messler, George Metz, John Metz, Morgan Miers, Willard Miers, William Miers, Charles Miller, Joseph Minor, John Mires, William Mobley, Joseph Moenkedick, George Moor (partial), Huber Moore, Clyde Morrison, Harry Mount, Nelson Mowrey, Henry Monzingo, Fred Mulford, Anthony Mulroy, David Myers, George Myers, James Myers, & John Myers. Eber Oldham, Bernard Ortman, John Osborn, & John Owen. Joseph Patterson, John Pavy, Dan Perry, George Perry, Ezra Pleak, Strauther van Pleak, Alexander Porter, Edward Porter, James Porter, Ernest Power, James Powner, William Pulse, Cyrus Pumphrey, Edward Pumphrey, Francis Pumphrey, James Pumphrey, & John Puttmann. George Redelman, Henry Redelman, George Reed, Charles Remy, Eden Riley, Zachariah Riley, Charles Risk, Charles Robbins, John Robbins, John Robertson, Josiah Robertson, Lafayette Robertson, William Robertson, James Robison, Max Ruhl, Albert Russell, & John Russell. Linton Sands, George Scheidler, John Schroeder, Robert Scott, Walter Scott, George Sefton, James Shafer, Wilson Shafer, Benjamin Shaw, John Shaw, Thomas Shaw, Isaac Shera, James Shortridge, George Shuperd, Reuben Smalley, Thomas Smiley, William Smiley, William F. Smiley, William G. Smiley, William S. Smith, John Spears, Randolph Stark, Thomas Stevenson, Samuel Stewart, Richard Stott, Frank Stout, Jesse Styers, & William Styers. Abram Talbott, Albert Taylor, Isaac Taylor, John Taylor, Charles Templeton, Nelson Templeton, Henry Thompson, James Throp, Wesley Throp, Jacob Thurston, Henry Townsend, Louis Travis, John Tremain, Oscar Trimble, James Turner, & Rollin Turner. William G. Updike, & John A. Urich. Strauther Van Pleak, & Abram F. Venner (partial). Isaac Waits, Elmer Walker, John Wallingford, Frank Weadon, George Weadon, Oliver Welch, Glanton Welsh, Isaac White, Andrew Willey, Andrew Williams, Richard Williams, Andrew Willoughby, Elmer Wooden, William C. Woodfill, William S. Woodfill, John Woodruff, Charles Woodward, Charles Worland, Caleb Wright, Londa Wright, Wilbur Wright, & Isaac Wynkoop. Of course, the names above are only the main persons profiled in the biographical sketches. In each biographical profile there are many other individuals mentioned: spouses, children, in-laws, cousins, siblings, etc. 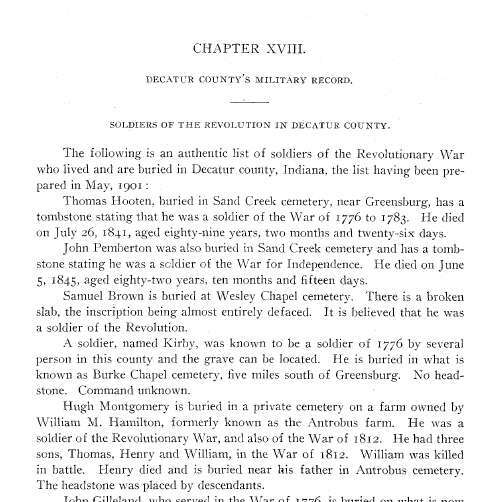 For example, I have transcribed the names found in the biographical sketch of Andrew S. Willey below. 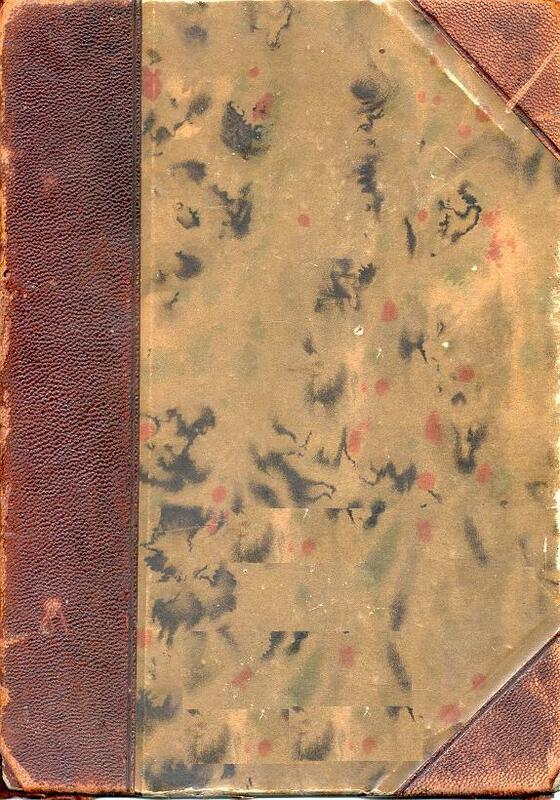 As you can see, there are thousands of persons mentioned in this 1,216 page book! Andrew Willey: Louis Willey, Mary S. Willey, Horace Willey, Anna Tate, Mary Sefton, William Sefton, Catherine Shuck, Billie Sefton, Samuel Shirk, Henry T. Sefton, Eliza Ellen Sefton, Elizabeth Sefton, Michael Sefton, Isaac Sefton, Edward Sefton, Mary Sefton, Sarah Sefton, William W. Sefton, William Henry Willey, Andrew S. Willey, Frank W. Willey, Bert Douglas, & Pauline Willey. 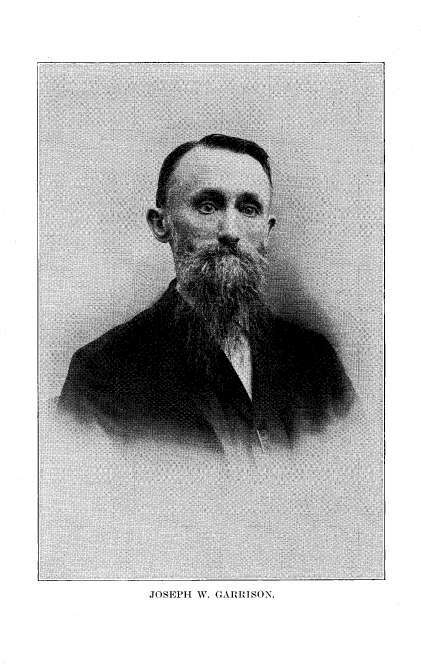 Another example is the biography of Jason B. Hughes (of whom there is also a portrait): Jason B. Hughes: John Hughes, Anna Jane Sefton, William Hughes, David Hughes, Sarah Hughes, Oscar Hughes, Thomas Hughes, Franklin Hughes, Thomas Hughes Jr., Frank Hughes, Chalmer Hughes, Thomas Hughes Jr., Lou E. Stewart, John W. Stewart, Keziah McCullough, James McLaughlin, Maria McLaughlin, Robert Mitchell, Lon Innis, Wilbur McCoy, Frank McCoy, & Sarah McCoy. Note: Four pages were missing from the original book - the entries for John Fear & James Wood. It removed part of the biographical sketch for Abram Venner & George Moor.